Out on 27th January 2015 - Holocaust Memorial Day and the 70th anniversary of the liberation of Auschwitz-Birkenau. Throughout this whole book I really felt like I could connect with the main character, Hanna, There were a few times when my heart clenched in fear for her and I smiled when she was happy. A stark and at times shocking and heart-breaking story that really communicates the horror of the Holocaust. Of the many stories of the Holocaust, that of the Jews of Riga in Latvia is among the less well known. This book tells their story for young people, clearly and honestly, emphasising its importance and relevance to us all. Readers will find it easy to identify with Hanna, which makes her account of what happens to her even more affecting... A powerful tribute to all the Latvian victims of the Nazis. Wow, not many books leave me speechless but this did. A true treasure of a book that will stay with you long after you finish the final page... A must read. This book is amazing, I really enjoyed it. The author really describes what it was like to live in a Nazi society, just before World War Two, as a Jew. about what children had to endure just because they were Jews! reading more of the author's work. A remarkably well told story that both astonishes and is heartbreaking while being beautiful written... I recommend this book for any fans of ‘Anne Frank’. Unforgettable and touching! The writing was brilliant and terrible in equal measures, it presented such a painful subject in quite a soothing way before completely tearing the reader apart with its harsh realities. A definite recommendation. 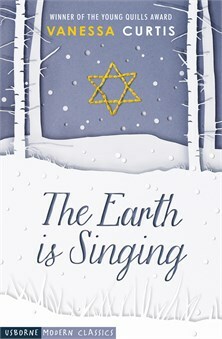 ‘The Earth is Singing’ was a beautiful, empowering book with a storyline so powerful, it’s enough to make anyone emotional. It was so capturing, you won’t be able to turn the pages fast enough! Heartbreaking, emotional, stunning... This truly heart wrenching story was dealt with truth and respect, producing a stunning book that I strongly recommend everyone to read. I've really loved everything by Vanessa Curtis that I've read so far. A tragic, harrowing and deeply moving account of the Holocaust from the perspective of an ordinary girl.